He strikes you as a silent guy, soft-spoken, poised and always ready with a smile. At first encounter, one finds hardly any trace of that quirky sense of humour so abundant in his self-written songs, nor can one imagine him working large mobs into frenzied appreciation. But, he does own a generous amount of the former and succeeds brilliantly in achieving the latter. Stick around for one of Tushar Maithani’s performances and you’ll know what we are talking about. 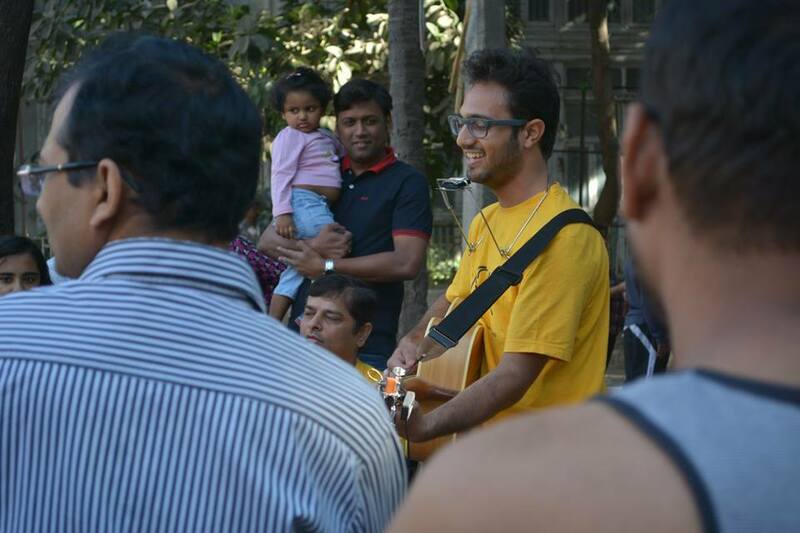 A long-time NSPA artist and veteran busker, as he leaves the NSPA to take longer leaps in his music career, Tushar talks to us about his time in the NSPA and what it feels like to be a busker in Mumbai. Your relationship with the NSPA has been a long-standing one and it gives us great pride to see you move on to greener pastures. Tell us about your experience working with NSPA, what motivated you to join the organization and what role has the organization played in your journey as a musician? I always knew that I wanted to pursue music in some capacity and this desire drew me to Mumbai, where I took up a job with Teach For India. Here, I came across performance photos of a friend and ex-colleague, Neeraj Arya, who was then an NSPA artist and this piqued my interest in the NSPA. On a whim, I applied to the NSPA and got selected after an audition. Back then, I had no idea that I would get paid for my performances. Just the thought of getting a chance to play in front of people in public spaces was so exciting that I didn’t want to pass the opportunity by. I put up my first performance in Bandra, in December 2013 and since then, I’ve been with the NSPA for around two a and a half years. The NSPA has been a lucky chapter in my life for many reasons, firstly for providing monetary support when I most needed it, secondly for giving me a chance to not just perform, but perform the kind of music I wanted to and most importantly, for helping me connect with other artists in the area. It was through my NSPA gigs that I garnered several other performance opportunities. In fact, offers for most of the music-related activities I do apart from the NSPA came to me during an NSPA performance or through an NSPA contact. So, I must say the NSPA has played a pivotal role in my journey as a musician. Busking is a difficult activity, one that demands a lot from the artist. How did you cope with the difficulties and disappointments that accompany the act? Has it lead to spells of self-doubt and low confidence or has it made you a more resilient performer? Busking is difficult, especially if you’re a solo performer, because that means you have to perform all by yourself, with no setup or even a fellow artist to give you company. To add to this, on a few lucky days you enjoy a large audience, however, on other days, the numbers dwindle to just one person, and at times, none. On such days, it depends on how you choose to deal with the situation. You can either play your best or your worst. You can use these setbacks to develop a thick skin and become a stronger performer, or you can let it break your confidence. It’s really a matter of perspective and choice. I would use these low traffic days to improvise on my music, jam with other artists and experiment with styles, ask them for feedback on my songs. So, even if there was no one around to watch me perform, I would still invest a 100% in my performance. Busking has also made me a confident performer, because the nature of busking is such that it forces you to perform in a range of surroundings and exposes you to different kinds of audiences. Today, I know for a fact that, irrespective of the venue or the size of the audience, I will still be able to put up a good show. So all in all, I’d say busking has had a positive rather than negative impact on me as a musician. You enjoy writing and have penned quite a few originals. Your “slice of life” compositions have a humorous edge and this is what makes your songs relatable and enjoyable. Has busking impacted your writing in any way? Yes, it definitely has. Busking has helped me grow as a musician and a songwriter. When I started performing my original compositions at railway stations or at Carter Road, I noticed that people weren’t really enjoying them. 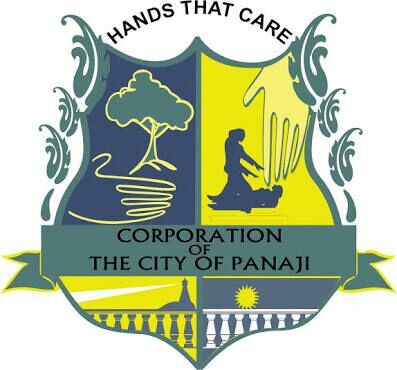 I realized that I would have to try something different, something that would captivate the interest of the average, middle class Mumbaikar on the move, who formed my primary audience. I wanted to stick to themes that I felt strongly about, but I also needed to add an extra something to make my songs stand out. That’s when I decided to start experimenting with humour, however the satirical, intellectually-stimulating kind rather than the crass, cheesy variety we’re normally treated to, like in Baba Sehgal’s or Honey Singh’s songs. I began writing songs with a sarcastic edge, with lyrics that poked fun at relatable, familiar problems people encounter. And guess what, these songs worked! Today, I have a bank of fifteen such songs, and every time I perform one of my originals, I get people telling me that they enjoyed the lyrics. So, in a way, busking helped me define the kind of songs I wanted to write, the kind of stories I wanted to tell through my songs. Unlike the stage, which almost physically separates you from your audience, busking places you much nearer, in fact within the midst of your audience. Has this heightened proximity to your listeners helped you derive unique matter for your songs? Have you come across particularly interesting people you’ve wanted to write about? Very often. In fact my first song, ‘Koi Aadmi,’ the lyrics of which go like this “Koi aadmi yahan pe naam bada kamaye, toh koi saala soch soch ke zindagi yuhi gavayein,” (some people here earn a great name for themselves, while some idle their lives away worrying) is what came out of my observation of people at the Mumbai Metro. You find some people who are so jovial even at the end of the day while others wear perpetual frowns. I try to capture such humorous paradoxes, eccentricities or life truths in my songs. Performing in public spaces then offers a wealth of matter and you never fall short of subjects or quirks or incidents to write about. 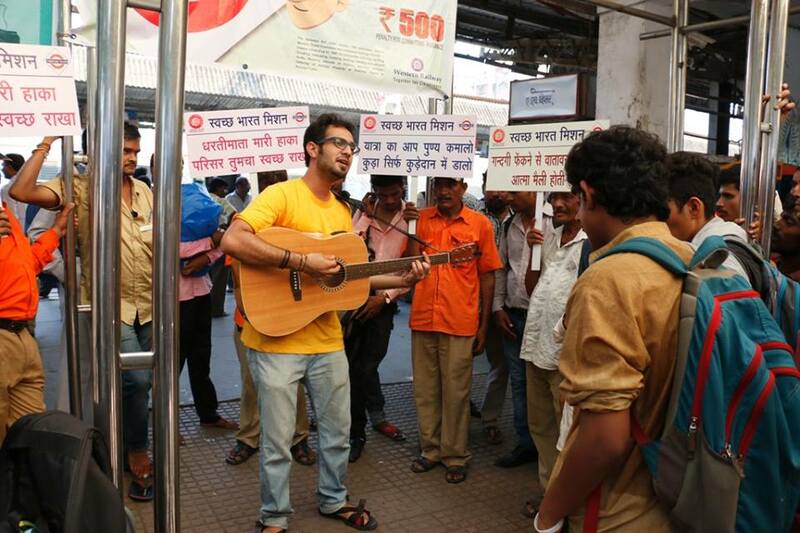 If busking were to become popular in India, i.e. busking in the true sense – playing for money, what impact would it have on the music and arts scene? Do you think Indian artists would welcome the concept? More importantly, do you think the Indian audience is ready to appreciate street performances and provide monetary support to a street performer? Over here again, it depends on the individual. Some musicians might be open to it while some might not be. For example, there is an uncle who plays the accordion at Carter’s and Bandstand and a dance troop that accompanies him. They’ve created a respectable act and they do busk for money. They’re so good that I’ve placed a 100 Rupees in their hat several times. If an artist decides to busk, then he should be really good. Often, you find people who can probably play a couple of chords playing on the streets. When the streets offer bad artists or music, people start believing that all artists who play on the streets are terrible. This makes them look down on buskers and consider the act of busking disrespectable. Right now, this is exactly how people react to buskers. In turn, this perception dissuades good artists from performing on the streets. I, myself, wouldn’t be comfortable with the idea of playing on the streets for money. However, it would be really nice if busking became popular and acceptable here, because it would be of big help to artists. It can become a source of income for them. So I would love to see such a culture in the country. Is there any incident, good or bad, that you remember vividly from your time busking? Also, if the opportunity arises, would you like to busk again? There are quite a few. I remember once NSPA was putting up its first performance at Vikhroli station, and I happened to be the artist performing there. I had to perform on a bridge and there was no standee or chair or any sign that a performance was going to happen. People were rushing past, lost in their own worlds and I had to perform in the midst of this chaos. At that moment, I felt really self-conscious and unsure. But, I decided to just play my best, and that’s what I did. At the end of my session, I ended up signing autographs! There was another time when a man offered me a 100 rupee note after my performance. I told him I couldn’t take the money, and then he said that he actually wanted me to sign on it! So, yeah, there have been quite a few memorable moments. And yes, given a chance, I’d definitely like to busk again. Tushar Maithani currently works with Raghav Sachar as an Assistant Music Director.